The Web Mapping Application enables you to explore a map and find information useful to you. A menu of tasks, plus the Toolbar for interacting with the map. 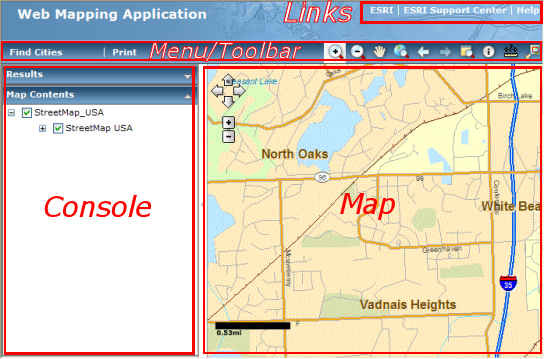 Console, on the left side of the page, provides information about the map contents and also displays results when added to the Console. You can hide and then show the Console as needed. Click the gray arrow just to the left of the map to hide the Console. Click the arrow (which now points to the right) again to show the Console. You can resize the area used by the Console by clicking and dragging the divider between the Console and the Map. This allows more room to view either area as you work. The content of the section is hidden but not deleted. Expand the section to see the content again. Console sections can be resized in height. To resize a section height, move the cursor to the bottom of the task section, until the up-down arrow appears. Click and hold the left mouse button, and drag the section up or down to resize. Some elements, such as the Measure window and the Magnifier window, may be moved around the page, collapsed and closed. You can arrange these elements to suit your own work. To move elements, click and hold with the left mouse button on the title bar of the element. As you hover over the element's title bar, the cursor changes to a four-way arrow, indicating you can move it by clicking and dragging. Drag the element to the position you want, then release the mouse button. If you accidentally move an element outside the visible window, you may move it back by using the browser's scrollbars to scroll the window until the element is visible, then drag it back to the main area of the window. To collapse the element, click the up arrow in its upper right corner. The element window collapses to its title bar. To restore it to normal view, click its down-arrow. Close a moveable window by clicking the close button it its upper right corner. Most such windows may be re-opened from the appropriate location. For example, the Measure and Magnifier windows may be re-opened from the Toolbar. Some element windows, such as Magnifier, can be resized to show more or less area. To resize, move the mouse over the right or bottom edge of the element window until you see the cursor change to a double arrow. Hold the mouse down and drag the window edge to resize it, then release.